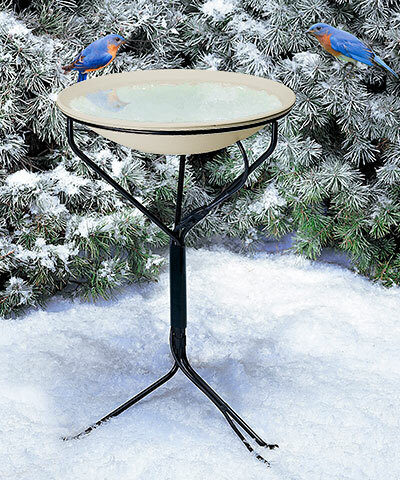 Create a gathering spot for birds year round using the Allied Precision Heated Bird Bath with Metal Stand. This robust unit is loaded with features that will bring birds into your backyard all winter and summer. The generous, 18.75" diameter basin has a textured surface and contoured rim, helping birds securely land and grip it. The gradual slope creates a 1.75" deep bath, enabling small birds to bathe and large birds to drink and preen. The hidden heating element uses 150 Watts of power, and the automatic thermostat activates the element when the water temperature nears freezing. This aids in keeping the water free of ice on even the coldest days, and the unit has been fully tested in sub-zero conditions to ensure it will not crack. Place this bath in the included, 24" tall metal stand, for a fantastic display in your yard. Use the included stakes to secure this stand in your soil, and tape the 13" long cord to the stand to better camouflage it. For extra versatility, use hardware (not included) to attach the bowl to your wooden deck rail. The beige hue of the plastic bath evokes stone, while the black metal stand enhances any surrounding. Bring birding fun to your backyard all year with this Heated Bird Bath with Metal Stand. Assembly required. Made in the USA. Three year warranty.